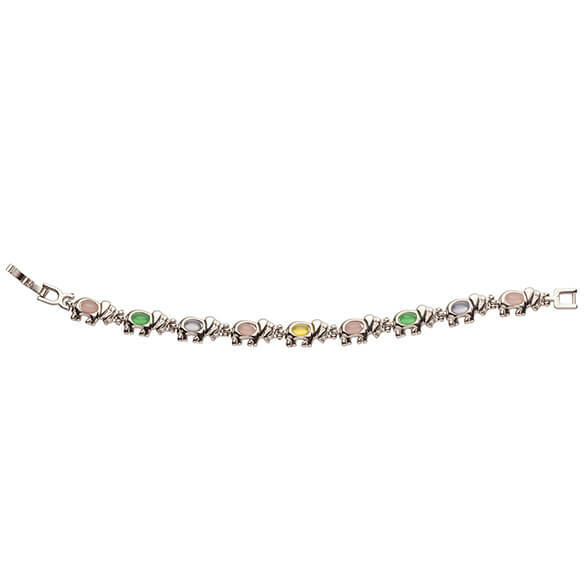 A rainbow of colored stones add standout style to this Magnetic Multi Colored Elephant Bracelet. Beautiful crystal magnetic bracelet features elephants — symbols of good fortune and peace —with alternating green, pink, lavender and yellow glass beads. Back side features discreet magnets, believed by many to encourage circulation and healing. TODAY WAS MY MOM'S 99TH BDAY. SHE LOVED ELEPHANTS AND I BROUGHT THIS IN HER HONOR FOR MY SISTER. Look,style and maybe it will help me with my pain.